Summer 2009 Week 11: Boating, Fishing and Snorkeling Adventure! We’ve been having so much FUN this past week that I just can’t believe its time to write another post! It seems like I just wrote last weeks blog yesterday. Where does the time go? 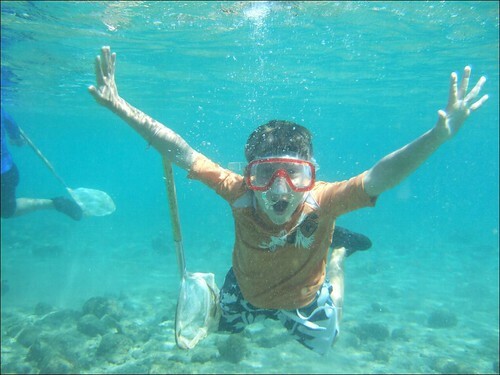 For us it has been spent boating, fishing, snorkeling, etc., and having all kinds of Adventure Fun!!! And like I seem to say every week, “It has been just GREAT, and I mean from start to finish!! !” It just doesn’t get any better than this!! The water quality this week has been the very best all Summer! Absolutely crystal clear, flat calm and so many fish around we don’t know where to begin or which direction to head. I have never seen so many snook, sheeps head and parrotfish like I have seen this week! Hundreds and hundreds and hundreds, every where you look there seems to be a dozen looking back at you!!! Now that’s what I call having FUN!!! And if you ask AdventureCasey, Maxwell, Joseph, Connor, Joshua, Armaan, Meher, Sienna and Neal, they would tell you the same thing!!! FUN, FUN, FUN from start to finish! Fun at the Rock Garden! We spent the first day going straight to the Rock Garden to do some snorkeling and check out the tremendous schools of fish that inhabit this area. The water was as clear as it could possibly be and we were the only ones here, no one else in sight. Our very own swimming pool full of fish! Just the way I love it!!! I could tell the life guard down the beach was wanting to join us. He was laughing at all the commotion we were causing, chasing this way and that with our nets in hand after pufferfish, blennies, toadfish, flying gurnards, flounders and lizardfish. We didn’t know where to begin. Every where we looked were fish in all different sizes, shapes and colors. Large schools of snook were all around us lying lazily in the shallows, their bellies gorged to the max on menhaden. And let me say, they were looking fat and happy!!! We could get within 2 to 3 feet of them before they slowly moved off. AdventureJoseph would swim around them and ham it up just for our entertainment to see if they would move. We spent a good bit of time searching for crabs under the rocks and found thousands, and I mean thousands of blue-legged hermit crabs. There seemed to be dozens under every rock, much to our enjoyment! We found some really cool mantis shrimp, popping shrimp and tiny pistol shrimp. Most of us even came up with some unusual porcelain crabs clinging to the undersides of the rocks. We all took turns checking out each others finds, and loved every minute of it!!! The sheep head would follow us around like puppy dogs wanting another handout, trying to catch the crabs under the rocks before we could. On many occasions I could reach out and touch them. Before long, the parrotfish were doing the same. We had a whole entourage full of fish behind us like we were playing follow the leader. It was just GREAT!!! 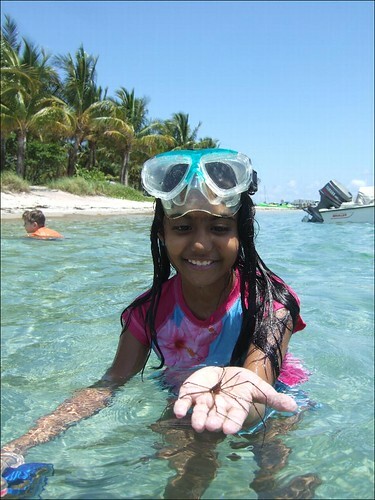 AdventureMeher found a big arrow crab that would sit on her hand like it belonged there, and did we all love that! Especially her!!! Meher with an Arrow Crab! Before the day was done we had found some beautiful queen conchs, hawkwing conchs, sea anemones, sea cucumbers, sea urchins, rock crabs, swimming crabs, blue claw crabs, mantis shrimp, and even saw a couple of flying gurnards and sea robyns which definitely aren’t too common around here. We saw a couple of barracuda and lizardfish eat other fish which definitely caused excitement in the group! The kids were loving that! It was so cool to see hundreds of Bermuda chub, parrotfish, snook, sheep head, snapper and grunts all around us. We never left this spot till it was time to go and I could tell no one was ready to call it quits yet. We were having too much fun!!! The next morning we went straight to the Big Sandbar to walk the shallows and see what we could discover. It wasn’t long before AdventureJoshua came up with a very big and beautiful, red cushion starfish. A rarity in this area. We all took turns checking it out up close and personal. It was great! Nice find Joshua!!! AdventureNeal really loved this!!! I could tell he was having fun by the smile on his face!!! 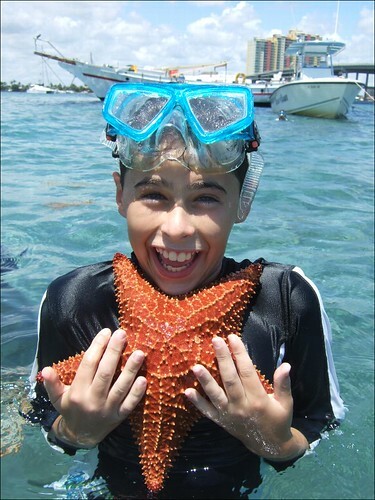 Neal with a Cushion Starfish! The rest of us spent some time checking out the fighting conchs, large mantis shrimp tunnels and catching small blue crabs in the sand. AdventureSienna found a nice beaded starfish and we all checked that out too. Nice find there also! Shortly after this we followed AdventureConor, Casey and Maxwell into the Hot Tub and had fun playing around here until it got almost too deep to stand . As the tide came in, it carried with it large mats of sargassum seaweed over the shallows. 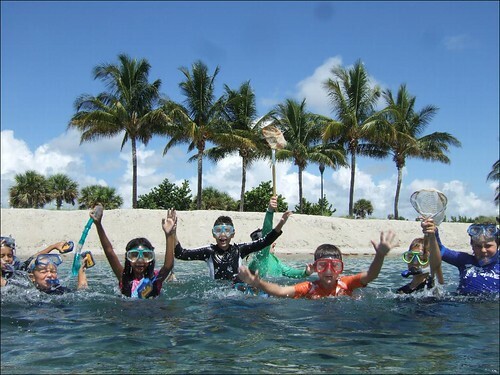 We all grabbed nets and scooped it up and found hundreds of Sargassum filefish, shrimp and crabs! With every scoop we found something cool!!! You never know what you may find. We never wanted to quit, but time was flying by and since the water was so clear and the ocean so calm, I wanted to spend the last hour going out to the beach and having FUN there. 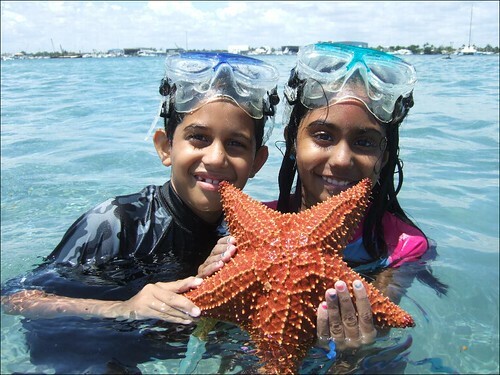 On the way back to the boat AdventureArmaan and Meher came up with a beautiful cushion starfish of their own. And I could tell, they loved this too!!! It just couldn’t get any better than this!!! As we rounded the jetty on the way to the beach, juvenile flying fish took off in every direction. It was neat to see so many this close to shore! I dropped anchor right next to the beach and we hopped out with our masks in hand and swam around collecting shells and sea glass and searching the beach for treasures. We found a hatchling loggerhead sea turtle tangled in the seaweed that didn’t make it to the water on time and appeared to be fresh dead. We took it out in the water anyway hoping it might “come back to life” but no luck. We were all a bit saddened by this, but this gave everyone an opportunity to check out a new born hatchling up close and feel the texture of its skin and carapace. We spent the remainder of the day walking along the beach looking to see if we could find anymore hatchlings in the seaweed that we might save and release into the water before they perished. No luck, but we looked anyway. 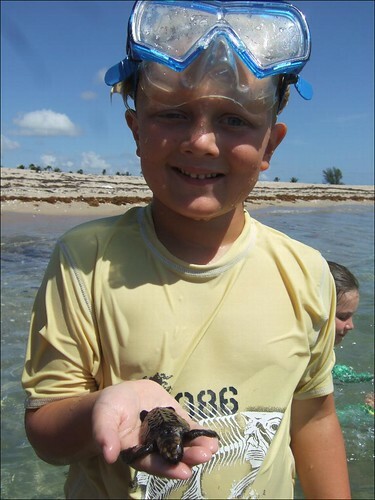 Casey with a loggerhead turtle hatchling! On the way back in we stopped by the Big Sandbar to frolic around and get our mind off the baby turtle. We ran back and forth along the shallows looking to find some things we hadn’t seen yet. We spent a bit of time searching for Mantis shrimp in their tunnels and when we’d find one, we would drop a small piece of broken shell into the hole and watch the shrimp come out and place the shell along the edge of the tunnel out of the way. I couldn’t help but feel it wanted to keep a clean house just like us! Loved watching that!!! It wasn’t long before everyone was laughing and smiling again, and having the time of our life until it was time to go! We had so much fun! 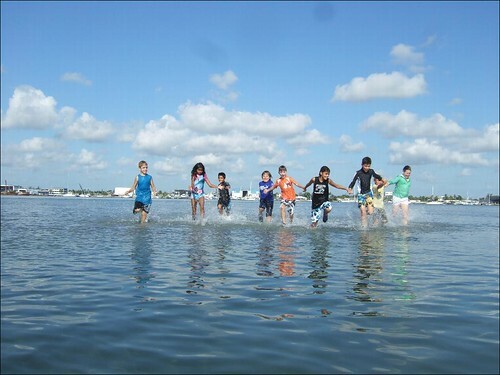 Fun at the Big Sandbar! Anyway, back to our adventure… As soon as we arrived at my secret spot and dropped anchor I could tell it was going to be a busy day. The current was moving and that always bodes well here! As soon as we dropped our lines down the action began!!! It was non stop from the very start and from that moment on, the rest seems just a blur!!! AdventureSheri and I couldn’t keep up with all the action these kids were having today. 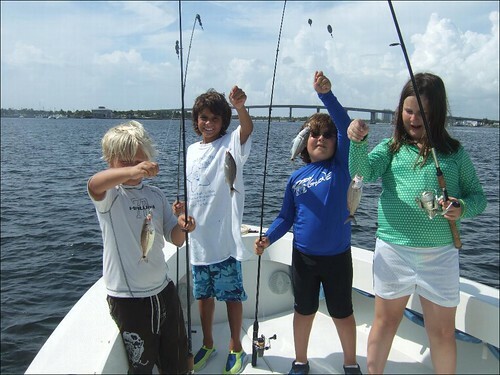 We baited the hooks and took fish off as fast as we could, but still we could never keep up!!! I didn’t get a chance to even look at my watch till almost three hours went by! Talk about being busy, and having FUN, We were having it now!!! Just the way I remember it!!! God, I just love it like this!!! I’m not sure who caught what or how many, but everyone was catching fish and having a blast, and that is what counts!!! We didn’t catch the big ones today, but what we lacked in size, we made up for in quantity!!! All I know is that AdventureSheri and I were beat by the time our fishing day came to an end, and we had smiles on our faces from ear to ear, and had an absolute ball!!! We spent the last half hour back at the Rock Garden swimming with the fish and enjoying life!!! When it was time to call it a day, I can tell you, nobody wanted to go, especially me!!! It just doesn’t get any better than this!!! I love this job!!! And the best thing about it all… We still have one more day left!!! I don’t know about you, but one things certain, we’re going to have FUN!!! I can’t wait till tomorrow!!!! It’s going to be GREAT!! !